Sergeant First Class Ronald Rosser had joined the Army as soon as he could do so after turning 17, in 1946. He served for three years and left the service. When his kid brother was killed in Korea, Rosser re-entered the service and demanded service in Korea in order to avenge his brother’s death. On January 12, 1952, Corporal Rosser was assigned to Heavy Mortar Company, 38th Infantry Regiment. 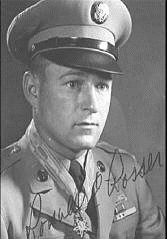 Rosser was the forward observer supporting an infantry company attacking a snowy hill defended by Chinese battalion near PONGGILLI, KOREA. By the time the 2nd Infantry Division troops approached the crest of the enemy position only 35 men of the 170 who started the attack were still able-bodied. The badly wounded company commander used Corporal Rosser’s radio to report his situation. He was ordered to make one more attempt to attack. Corporal Rosser, seeing that the company commander was in no condition to reorganize the unit and continue the attack, volunteered to lead the attack. Some of the men followed him as he moved through the area preparing the attack, others tried but could not move, others started and fell out, exhausted. Halfway to the objective Corporal Rosser realized that he was alone: from that point on, it was individual history as Rosser charged “like a wild man,” armed only with a grenade and a carbine. Obliviously, he charged through the snow reaching a bunker with nine Chinese defenders, killing first one and then another, then leaping into the trench line and killing five others. Two escaped to another bunker and Rosser followed, threw his grenade and shot the two as they attempted to escape. He moved to another trench line and killed twelve more Chinese. Out of ammunition, he ran down hill to resupply himself by stripping ammunition and grenades from dead soldiers. He attacked the Chinese again, still alone. He killed seven more of the enemy with a grenade into the first trench he encountered going back up hill and then began firing at every enemy soldier in the open. Running out of ammunition, he again rearmed himself by going downhill, and attacked uphill once more. After more than an hour of fighting, Corporal Rosser organized a withdrawal of the company, ordering each man who was able to take a wounded or dead man back with themselves. Returning to the United States in May 1952, Corporal Rosser announced to his mother that he had avenged his brother’s death. President Truman awarded him the MOH on June 27, 1952. He stayed in the Army until he lost another brother in Vietnam. When the Army refused his demands to be assigned to Vietnam, he eventually retired. He lives in Ohio.